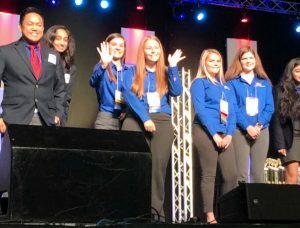 Center from left: JM graduates Dulcie Hanson and Brittany Smith are recognized on stage during the National TSA Conference. Approximately 8,000 middle and high school student members from across the country attended the 2018 National Technology Student Association (TSA) Conference at the Georgia World Congress Center in Atlanta, the same location where TSA held its first national conference in 1978. At the national conference, John Marshall High School students Dulcie Hanson and Brittany Smith earned 7th place in the high school “Debating Technological Issues” category.